Welcome to DonaldHyatt.com, a website for Donald W. Hyatt and Stonehouse Creek Nursery. 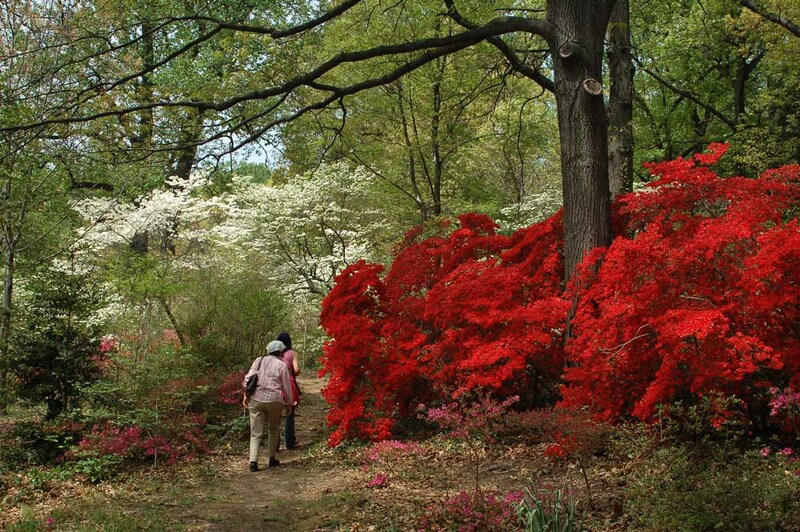 One of Don's main interests for nearly 20 years has been the preservation of our beautiful native azaleas and other wildflowers and the scenic places where they grow. 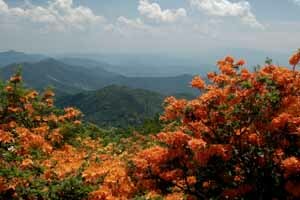 Pictured to the right are some Flame Azaleas ( Rhododendron calendulaceum) photographed along the Appalachian Trail in North Carolina. Botanical illustration in watercolor has also been a passion that he put on hold for much of his teaching career. This site contains lots of information on rhododendrons and azaleas but also images of Don's artwork in the Gallery where you can see some of his illustrations and limited edition prints. Over the years, Don has sold native azalea seedlings, rhododendron hybrids, and other choice plants but typically through plant society sales or farmer's markets. Now that he has retired, he prefers to spend his time traveling so he can appreciate the many beautiful horticultural sights in this world. 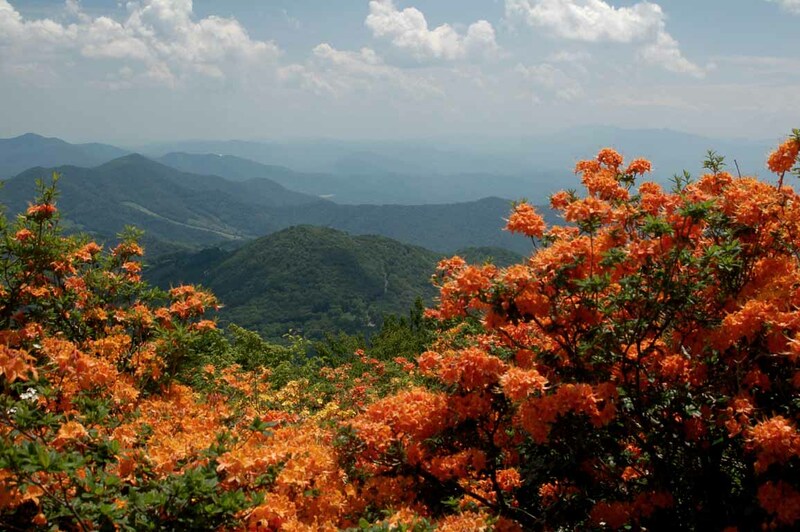 Don has become a sought after speaker on various plant related topics including native azaleas, rhododendrons, evergreen azaleas, wildflowers, flower photography, and general landscaping. He has given multi-media presentations at many conferences in the US and abroad. 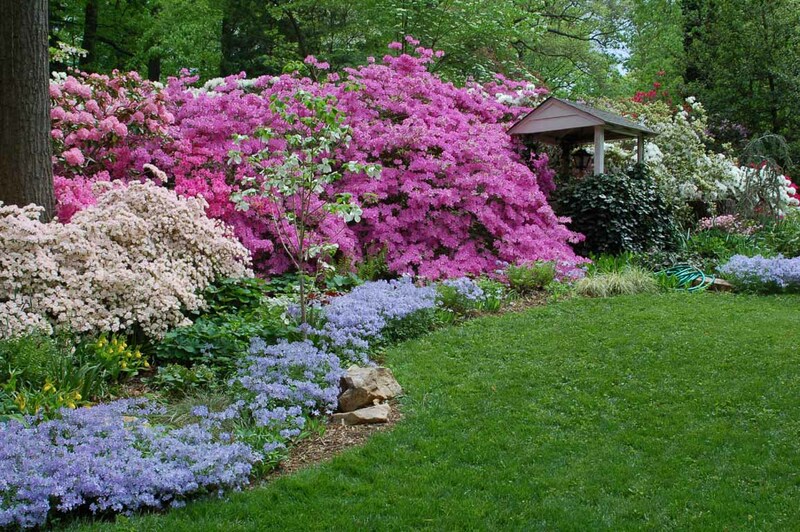 He has received numerous honors in horticulture including the Silver Medal from the American Rhododendron Society in 2002, and the Gold Medal in 2012. Don still maintains a private garden (pictured left) at the family home in the suburbs of Washington D.C. where he grew up. Over many years, he has developed a beautiful landscape of rhododendrons, azaleas, and companion plants. He started his first garden there in 1951 at the age of three, so many of his plants are quite large now. His garden was one of those on tour for the 2009 Azalea Society Convention that was hosted in Northern Virginia. For 33 years, Don was a Fairfax County Public School math and computer science teacher and was the Computer Systems Lab Director at Thomas Jefferson High School for Science and Technology from the time the school opened in 1985 until his retirement. His students won many national and international awards, including a million dollar supercomputer in 1988. Don was a Finalist for Teacher of the Year in Fairfax County in 1989, but he has always had a life-long interest in plants. More about Donald Hyatt, his lovely private garden, and his nursery. Original articles illustrated with beautiful graphics on native azaleas and plants in the wild. 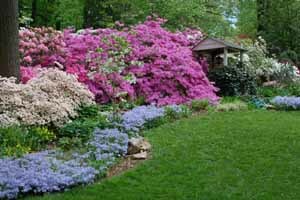 Helpful gardening hints related to rhododendrons, azaleas, gardening, landscaping, propagation, travel, and more. Don's Art Gallery of botanical illustrations including limited edition prints he offers for sale. More about Stonehouse Creek Nursery. Contact information on how to purchase Don's artwork or other items offered for sale through his nursery. Additional links and other web pages of interest including a site map.